"The births, lives, secrets, times and deaths of Ennis del Mar and Jack Twist. What happened before they met, while they were together and....after that cabinet door closed?" 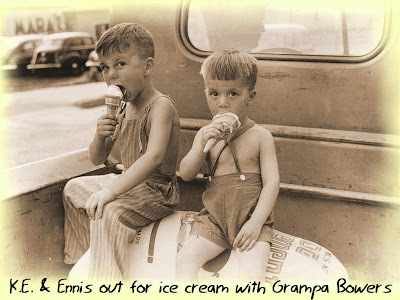 200 images and deleted scenes, covering every event from Ennis' birth in 1943, the deaths of Earl & Rich, Jack's childhood, the wreck that killed Ennis' parents making him an orphan, Jacks 1962 summer on Brokeback, Ennis & Jack's 1963 summer in detail, Jack's grizzly murder - with Ennis accused of it, Jack's parents' untimely mysterious deaths, why Jack was cremated and what happened to his ashes, and how Ennis survived 'til his own death in 2006... "
It appears to be a very elaborate epic, complete with maps and illustrations, that also includes the short story, the script and deleted scenes, in addition to the author's imagination. I haven't read it yet, but wanted to post it for those who might be interested. I noticed that too, Jeff! I wonder where Vernon "Jet" Gardner is from? I wonder about his spelling and usage. In the U.S. anyway, grizzly more commonly refers to a species of bear. Grisly is used to mean something inspiring horror or fear. Grizzly can be a variant of grisly, but not commonly. Unless in "The Complete Novel" Jack has a pet bear that gets killed, and Ennis gets accused of murdering it? There are plenty more such grisly errors. Kyle had a "cleft palette". Oy. And Earl hired "intenerate" workers. Double oy. I'm not a fanfic reader by any means. However, I tried reading a few chapters of this saga. I found it to be clunky and heavy handed, with ridiculous coincidences and laden with conspiracy theories. Oh, and everyone is gay. Ugh. I was thinking of getting this, now maybe I'll skip it. Kyle was an artist? Must be difficult to paint if your palette is cleft! "Palette" and "grizzly" you could blame on Spell Check, but not "intenerate."